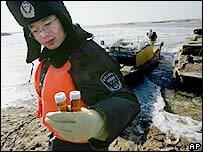 Russia is airlifting 50 tonnes of chemicals to try to tackle a toxic spill expected to flow into its rivers from China, Russian media say. The activated charcoal is needed to treat benzene that spilled into the water after an explosion at a chemical plant in Jilin on 13 November. The contamination of the Songhua river affected 3.8m people in Harbin city. Mains water supplies in Harbin have now resumed, five days after they were cut off as a result of the toxic spill. The Songhua eventually flows into the River Amur in Russia and the pollutants are expected to reach the Khabarovsk region in the coming days. The airlifted carbon will be used in water treatment plants along the Amur. Oleg Mitvol, deputy chief of the Federal Service for Supervision of Natural Resources, who has been sent from Moscow, said the authorities would declare a state of emergency in Khabarovsk when the spill reached Russia. Cold and hot water supplies will be cut off for at least 40 hours and schools, childcare organisations and restaurants will close. "There is no panic in [Khabarovsk]. People all have enough spare supplies of water. We won't see what happened in Harbin here," Mr Mitvol said. China has apologised to Russia for the pollution heading towards its rivers. The toxic leak passed Harbin early on Sunday morning, said Lin Qiang, a spokesman for the provincial environmental protection bureau. Provincial governor Zhang Zuoji took the first drink after supplies were reconnected, the Xinhua news agency said. For the past five days, Harbin's residents have been relying on bottled water and water delivered by lorries. Inspections on Saturday evening revealed that water quality in the Songhua river upstream of Harbin had returned to national standards, Xinhua reported. The restoration of supplies at 1800 (1000 GMT) on Sunday came five hours earlier than expected. However, the government warned the public the water was not completely safe to drink as it had been lying in pipes for five days. TV stations are to use a traffic light-style system to inform residents about water quality. A red indicator will mean the water is unusable, yellow that it is suitable for bathing only, and green that the supply is fit for drinking.